Also known as Phansi, French beans are smaller than common green beans and have a soft, velvety pod. They are delicious in taste, tender and wonderfully crispy. The glycemic index of French beans is 15 and the glycemic load is 1 due to low carbohydrate content. It proves to be beneficial due to fair amount of vitamins and minerals. Is French Beans safe for Diabetics? French beans have low glycemic index of 15 and glycemic load of 1. 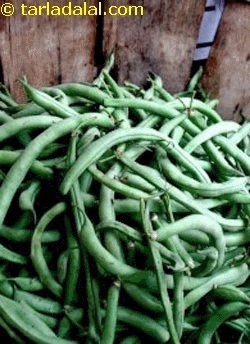 ¾th cup of chopped French beans have only about 3.3g of carbohydrates which makes it a suitable option for diabetics. This low GI vegetable proves to be beneficial because the carbohydrates releases slowly into the bloodstream and do not let the blood glucose levels fluctuate. Some amount of fiber (1.3) in ¾th cup of chopped French beans contributes in controlling the appetite. Is French Beans suitable for Weight Loss? Being exceptionally low in calories, just about 20 in 3/4th cup of chopped French beans, it comes out as a great option for all the weight watchers. 1.3 grams of fiber in ¾th cup of chopped French beans helps you remain full for longer period of time. It slows down the production of ghrelin- the hunger hormone which stimulate the brain to eat again. Thus control your appetite and reduces your calorie intake. Combine your French beans with other vegetables and have it as a sabji with chapatti/ bhakri.